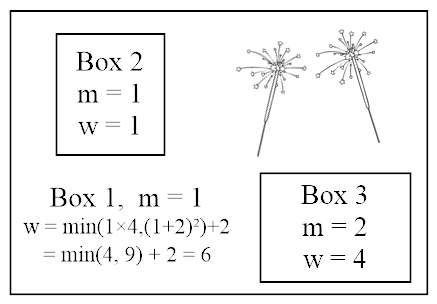 where m is the mysteriousness of the box, s is the number of sparklers in it, and wi and wj are the weights of the two boxes within this box. If the box is completely empty, assume a value of infinity for wi×wj. Tenri's magic show requires a single box which contains all the other boxes and sparklers either directly or indirectly. The overall impact for the magic show is the weight of the outermost box. Please determine the maximum impact Tenri's magic show can have. The first line of input has 2 integers, N and S, the number of boxes and the number of sparklers Tenri has, respectively. N is guaranteed to be an odd number. Each of the next N lines contains a single positive integer less than or equal to 10, the mysteriousness value of i-th box Tenri has. Output the maximum possible impact Tenri's magic show can have. min((min(∞, (1 + 0)2) + 0) × (min(∞, (2 + 0)2) + 0)), (1 + 2)2) + 2 = 6.